Please note: Releases on the His Master's Voice label often also display the EMI logo. This indicates that His Master's Voice was part of the EMI Group and EMI should not be added as a label. 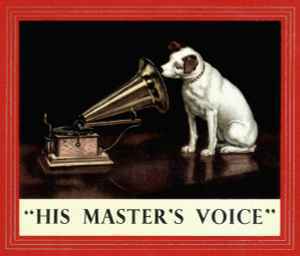 His Master's Voice (HMV) is a label created in 1901 by The Gramophone Co. Ltd., which was founded in 1897 in the UK by the US businessman William Barry Owen. In 1899 the painter Francis Barraud sold, for £100, the rights to the portrait of his dog 'Nipper' listening to the gramophone. The first records with the dog logo were released in 1909. This label is not for releases on the primarily US-based Victor and RCA Victor and related labels which used the dog portrait and slogan starting in 1902. In 1931, parent company The Gramophone Co. Ltd. and Columbia Graphophone Company Ltd. merged to form Electric & Musical Industries Ltd. (EMI), however His Master's Voice label remained under the immediate control and registered ownership of The Gramophone Co. Ltd. In 1973, the rights to the label (trademark) were reassigned to renamed company EMI Records Ltd.
For unofficial releases using the identity of this label, see His Master's Voice (2). Please note: HMV is used for the UK record retail chain behind some promotional and reissue releases (circa 1989 to present day).